And they were right: the audience saw harrowing images and heard troubling narration, as the introduction to each of the shortlisted pieces of human rights journalism, across 10 categories in digital, print and radio. It was the BBC Radio 4 Today programme’s Justin Webb, presenting the national newspaper prize, who reminded us of the substance behind the ‘future of journalism’ conversation. Joking that he’d undergone hardship in his own reportage (sometimes they went half-an-hour without a snack on the Obama campaign trail! ), he said it was testimony to the diligence of the shortlisted contenders that they had completed this journalism. They, he said, had put aside the “chatter” of the organs for which they work and “talk of paywalls” to pursue their subject matter. It was a particularly timely day for the awards – Amnesty International UK director Kate Allen mentioned the seizure of the Gaza flotilla activists by Israel, and the media’s vital role in reporting events. A special award for journalism under threat has been given to independent media workers in Burma, to raise awareness of the plight of 2,200 political prisoners held by the ruling junta, including more than 40 journalists. In addition to the main prizes, two young entrants were named Young Human Rights Reporter of the Year winners, in a new prize set up by Amnesty International UK in collaboration with the Guardian Learnnewsdesk. Their pieces on bullying and child detention at Yarl’s Wood can be read on the Guardian site, along with the other shortlisted entries. I’ve link to some of the shortlisted videos shown last night. Not all content is available to watch/listen in full, but even these snippets are a reminder of the kind of content that should be protected – and prioritised – in the trade and in discussions on the future of journalism. Seyi Rhodes, Channel 4 Unreported World. ‘People and Power: Interrogating a Torturer’, Al Jazeera, Rodrigo Vasquez. ‘Stolen Childhoods’, Herald Scotland, Lucy Adams, Marc Turner. ‘The Truth about Torture – Britain’s Catalogue of Shame’, the Guardian, Ian Cobain. Investigation into the death of Ian Tomlinson at the G20 protests, the Guardian, Paul Lewis. ‘Rio’s lives of crime’, Le Monde Diplomatique UK, Raphael Gomide. ‘Tourism is a Curse to us’, Observer Magazine, Alexander Renton, Caroline Irby. ‘Zimbabwe’s Impoverished Elderly’, BBC Online, Kate Holt. ‘Zimbabwe: What Mugabe Didn’t Tell Us’, BBC Radio 4 – Today Programme, Mike Thomson, Edward Prendeville, Ceri Thomas (winner) (related content here). ‘Dispatches: Terror in Mumbai’, Channel 4/Quicksilver Media, Dan Reid, Eamonn Matthews. ‘The End of Sri Lanka’s War’, Channel 4 News/ITN, Jonathan Miller, Nick Paton Walsh, Nevine Mabro, Bessie Du, Matt Jasper, Ben de Pear (winner). 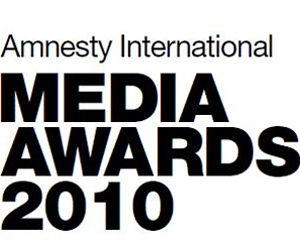 This entry was posted in Events, Press freedom and ethics and tagged Amnesty International, Amnesty International UK Media Awards, amnesty media awards 2010, Gaby Rado, human rights, media ethics, press freedom on June 2, 2010 by Judith Townend. Here’s our bit to help Amnesty International’s video campaign go viral, with an embed of their ‘You are Powerful’ video, set to REM’s ‘Until the Day is Done’. To celebrate 60 years of the Universal Declaration of Human Rights, the charity has launched this film, which, using special effects, shows members of the public preventing human rights abuses. This entry was posted in Press freedom and ethics and tagged Amnesty, Amnesty International, video campaign, you are powerful on December 10, 2008 by Judith Townend.